I leave for Spain in just over a month and I am S O F R E A K I N G excited!!!! Since the moment I bought my plane ticket, I immediately went into planning mode - browsing Instagram, Pinterest, Youtube, and other blogs for any new traveling/organization hacks I can pick up. 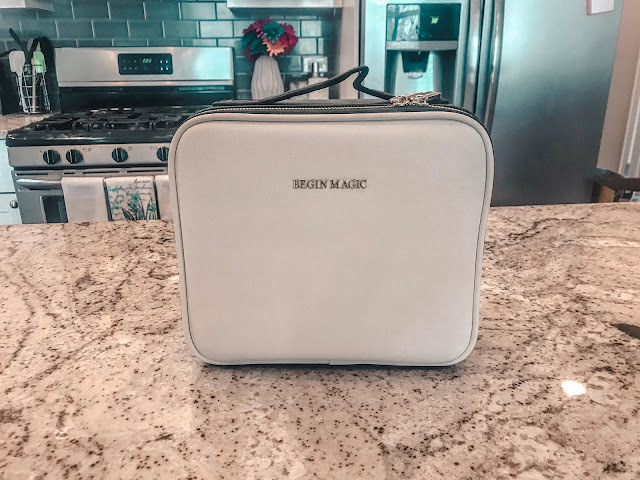 During my incessant search, I found the best travel makeup case to perfectly organize, store and travel with all my day to day makeup essentials and skincare items and I couldn't wait to share it with everyone. SHOP THE MAKEUP CASE HERE! Structure - the days of digging through what sometimes seems like a bottomless pit of a makeup case are over!! Compartment for palettes - The zipper compartment creates a separate space that can fit two full size palettes. Affordable - UNDER $30 LIKE R U SERIOUS! Comes in two sizes - I got the smaller size for reference! This is the perfect travel size. I think the large size would be great to keep at home for a makeup case. I seriously couldn't believe how much I could fit in the bag! * Disclaimer - I know I said I fit my skincare products along with my makeup and you may be like sis, where are they at then? Well, it wasn't a lie! I always make sure to travel with travel size/deluxe sample size pieces of my favorite skincare items so that they all in fact WOULD fit with my make up ;) (huge travel hack). That makeup case looks like it could fit everything!! You will have an incredible time in Spain! I was there last year and loved it! And this makeup case is incredible!! This bag is so handy! I'm constantly buying new make up bags to travel with but then end up buying a new one because I don't quite love the one(s) I had before. I hope you have an amazing trip! That does look like a great makeup case. I love that you can adjust the compartments and there are spots for all your brushes on the lid. Yessss! I love how customized you can make this! This makeup case looks AMAZING - I definitely need this in my life! A make-up bag is essential! omg...I remember when the zipper broke off of my make-up bag and I had to use a grocery store bag! lol! I am sold. This makeup bag looks perfect for travel. I am so going to get me one. Thanks so much for sharing! aw yay, you're going to love it!! love this make up case! great make up case, looks like the perfect make up bag for travelling. Enjoy Spain!!! this has definitely made my life sooo much easier lol! Wow it really does fit a lot! What a great piece to travel with! I hope you enjoy your upcoming trip! Aw, thanks so much Mica - I'm really looking forward to it!! Love this functional make-up bag! It's perfect, love!